2016 Tech Tool Tourney: Games Edition! Congratulations to the winners of our first ever Tech Tool Tourney: Construct 2 and Kerbal Space Program! 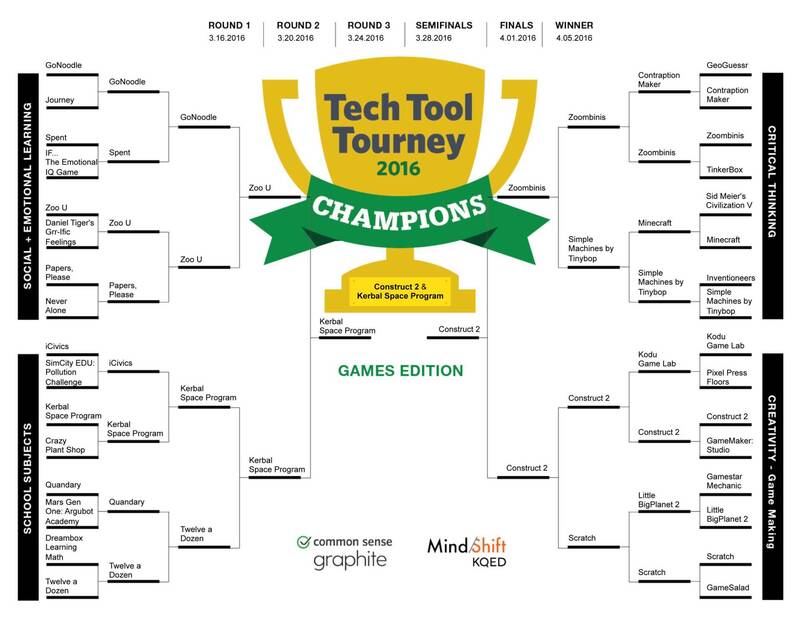 Construct 2 and Kerbal Space Program won four rounds of voting to face each other in the 2016 Tech Tool Tourney Games Edition Championship. Voting for the championship round started on April 1 and ended on April 4. In the end, we at KQED MindShift and Common Sense Graphite decided to award the title of co-champions to both games. We are honored so many gamers got excited about our bracket. The original 32 games were selected because of their outstanding quality and educational value. You can find teacher reviews for these games, along with thousands of others, at Graphite. Thanks to this tourney, game enthusiasts and educators were introduced to new games, and we couldn't have done it without you! GoNoodle creates an efficient and effective way to provide five- to 10-minute bursts of physical exercise right in the classroom. What really stands out is the sheer variety of activities kids can participate in, from Zumba to yoga to Wii Sports-type running games. Journey crafts a metaphor about what life is all about, and -- through a brilliant, unique co-op experience that randomly weaves in another player (either real or computerized) -- players reflect on companionship, loneliness, friendship, love, and loss. This absorbing platformer is less about what's happening on-screen and more about what's happening inside us. Spent is sort of like a jazzed-up, text-based, choose-your-own-adventure story but with a powerful message about social justice and empathy. Players are thrown into the tough -- often impossible -- life of someone living on the poverty line; they choose a job, get a set income, and must make choices based on events that pop up. IF... The Emotional IQ Game is an adventure game that helps kids age 6 to 12 develop the skills that lead to emotional intelligence. Inspired by the poem "If" by Rudyard Kipling, the app leads kids on a quest that promotes self-awareness and positive social communication. Zoo U is a powerful and focused social problem-solving game designed to reach kids who need direct instruction. Given a variety of situations, conversations, and social encounters, kids make choices to practice building skills such as empathy, managing feelings, self-control, and more. Daniel Tiger's Grr-ific Feelings is an early education social and emotional learning app for preschoolers and kindergarten-age kids. Songs and activities help young kids learn to express, recognize, and understand emotions. Papers, Please is a simulation video game that puts students in the role of an immigration officer for a fictional communist nation. Players are forced to make tough ethical decisions as they check an ever-increasing number of documents to decide who is approved or denied entrance to the country. Never Alone is an adventure puzzle game based on Inupiat (Alaska Native) lore, tales, and characters, developed in cooperation with Upper One Games, the first indigenous-owned video game developer in the U.S. The core of Never Alone is its themes, derived from Inupiat and Alaska Native cultures: togetherness, interconnectedness, love, respect for all things, and storytelling. iCivics was founded by retired Supreme Court Justice Sandra Day O'Connor to reverse a decline in civic knowledge and help kids better understand and respect the U.S. government. Sixteen well-designed games simplify complex topics such as citizenship, rights, the court system, governance, freedom of speech, and constitutional law. SimCityEDU: Pollution Challenge features six missions, each with three to five challenges, that explore the effects of pollution and other environmental issues on cities. Based on the SimCity engine, SimCityEDU has players tackle practical city-planning issues such as how to create more jobs without causing more pollution or how to get every kid to school by planning the most efficient use of bus stops. Kerbal Space Program is somewhat like a NASA simulator except it's set in a fictional star system and on the planet Kerbin. Players purchase various rocket parts, put them together, and then see if they can get their ship into orbit, to one of Kerbin's two moons, or even to another planet. This accurate rocket sim encourages trial-and-error learning and makes for great (often explosive) physics and engineering experiments. Crazy Plant Shop is an engaging science game that embeds learning about Punnett squares and genetic expression into a shop sim. Students assume the role of a plant shop manager who must breed specific types of plants to fulfill customer orders. To get the right plants, students need to combine and breed plants using knowledge of dominant and recessive traits and Punnett squares. Quandary is an online ethics game that teaches students how to gather and evaluate information to make better decisions. As a space colony captain, students solve three difficult challenges by consulting colonists and choosing a solution that is likely to be most beneficial. Mars Gen One: Argubot Academy is a clever role-playing game that follows a new cadet through the first days in a colony on Mars. The cadet's task is to learn the art of using argubots, special robots that allow users to appeal to authority, cite consequences, and offer observations in the course of making an argument. DreamBox Learning Math is an interactive, adaptive, self-paced program that provides engaging activities for students in kindergarten through sixth grade to learn and practice skills and concepts in mathematics. The two platforms -- one primary and one intermediate -- each offer a fun, game-like atmosphere to hold kids' interest. Twelve a Dozen is an engrossing platform-style puzzle game that challenges kids' math and thinking skills. As kids progress through 30 levels that increase in difficulty, they help the main character, Twelve, overcome math-related challenges, unlocking new levels as they go. Geoguessr is an addictive online puzzler that tasks students with guessing the location of Google Street View images from around the world. When they're ready to guess, students drop pins on a map next to each picture, but not before scouring the image for clues. At the end of each round, the game shows players how close their guesses are and awards points based on proximity to the real locations. Contraption Maker brings Rube Golberg machines to life as players take on the role of wacky engineers. Prebuilt machines with a few parts missing challenge players to repair a chain of actions to reach a goal, maybe trapping a mouse or freeing a balloon. With more than 100 parts, the variety of built-in puzzles range from simple tutorial challenges to advanced brain teasers. Zoombinis is a logic puzzler that promotes powerful thinking skills, resilience, and decision-making through gameplay. Players command a crew of rotund blue characters uniquely defined by features such as eyes, hair, and nose color through a series of puzzles en route to a new communal home. Each puzzle requires pattern recognition, deductive and inductive reasoning, and spatial arrangement based on the characters' defining features. In TinkerBox, kids can work their way through six levels of puzzles, each offering many stages, where they drag the right object into place to complete a physics puzzler -- think Rube Goldberg machines. They can also create their own inventions using the objects, including balls, bolts, chains, connectors, conveyer belts, fans, wheels, ropes, scissors, switches, wrenches, and more. Civilization V lets students step into scenarios spanning time and geography from colonial America to feudal Japan to the Ottoman Empire. Players expand and grow civilizations through time, pursuing historically based -- but ultimately fictionalized -- scientific, political, and societal advances as they explore the world, stake their claims, and grow their cultures and cities. Minecraft is a sandbox game that can be adapted to fit nearly any objective or subject. Players collect and combine resources into new, useful items that enrich gameplay and help further exploration and creativity. Although it has an "End" zone for players who want to fight the game's boss (a dragon), Minecraft has no plot -- the story is up to the player to define. In Inventioneers, kids either create their own inventions or build inventions to accomplish a given task. For example, in one task, kids are given a piece of cheese shaped like a ramp and an Inventioneer that can blow on objects to move them. Kids have to arrange them in such a way that will help (gently) blow a cat out of a tree so it falls safely into a basket below. Simple Machines lets kids manipulate tools to explore physics concepts. They'll use a wedge to split up an iceberg, push a lever to destroy a castle, drag planes into the sky with pulleys, lift fishtanks with screws, and play pinball with inclined planes. Each step of the way, kids are changing variables to see how the machine reacts. Kodu Game Lab is a tool for making 3-D video games without all the toil and complexity of hand coding. Kodu's visual menus let students act as game designers, pointing and clicking to create objects and define their behaviors in the game world through visual, Lego-like "if this, then that" statements. Pixel Press Floors gives students the tools to create and customize their own video games, bringing their ideas to life and allowing them to share their creations with a global community. Students draw their ideas for a game using pencil and paper, take a photo, and upload it to their levels. Construct 2 is a Web-based 2-D game-creation tool that doesn't require knowledge of programming languages. It uses a paneled interface reminiscent of older Windows programs with the main panel in the middle containing a tabbed area that shows off the game's playing area. Designers can drag these objects into the various game screens they've set up and then start programming behaviors for them. GameMaker: Studio is the real deal; its drag-and-drop programming system allows new designers to jump right in. When they want access to more flexible or nuanced behavior for game objects, these would-be designers can switch over to the built-in scripting language. An additional program may be necessary to create art assets, but GameMaker also includes a basic sprite editor. Gamestar Mechanic is an online toolset, game, and community that teaches kids how to build games. It focuses on the art of visual design rather than on programming. A series of manga cut scenes and "missions" ask kids to play, fix, and make different kinds of games built around specific mechanics, such as collecting points or jumping. LittleBigPlanet 2 is like Super Mario Bros. but with some physics and Rube Goldberg flavoring mixed in. After players get their fill of the developer-created levels, they can create their own and share them with an active community. Players try out each other's levels, rate them and provide feedback, and even copy and remix other people's creations. Scratch is a project from MIT's Lifelong Kindergarten group that teaches math, programming, and creative expression through technology. Most of the learning is tacit and supported by classroom teachers helping kids learn to code. Students can create animations, games, and models that communicate artistry and learning. GameSalad is an easy-to-use game-making app that scaffolds programming with a drag-and-drop interface. A tabbed panel at the top left allows designers to drag various objects onto the other panels that show a main stage and attributes for selected actors. Following the first tutorial, kids can easily make their first game in an hour.